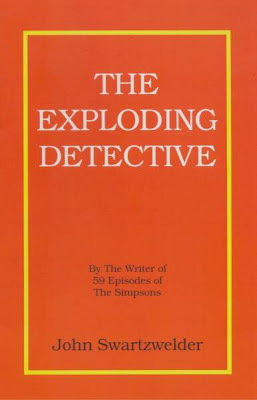 "Any true fan of The Simpsons will know the name John Swartzwelder. He wrote dozens of episodes, and was a consultant for most of the rest. Any truly bizarre joke on the show was sure to be a Swartzwelder creation. Once his role with the show diminished (by his own choice, mind you) Swartzwelder took is odd brand of comedy to the printed page. The Time Machine Did It was his first attempt in the medium. The story begins with self-proclaimed private eye, Frank Burly. He is our narrator, our hero, and one who is obviously oblivious to his own inadequacy. The adventures of Frank Burly take off very quickly when a client asks him to retrieve a stolen time machine. The plot contains many twists and turns, most of which don't make any sense. (Please keep in mind, making sense was never a strong point for Swartzwelder, nor has it ever been particularly important to him.) We readers meet some interesting characters, and memorable settings. The story, as a whole, is average, predictable, and dare I say, a little hackneyed. Fortunately, the story is not what sells this book. The dialogue is priceless. Frank Burly's internal dialogue is even better. The narration as a whole is what makes this book a worthwhile read. Swartzwelder's manner of writing/thinking/speaking is so unique and interesting, that he could be writing about paint drying, and find a way to make it funny and enjoyable. 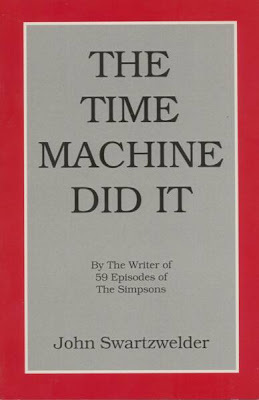 While I feel that any fan of pun and slapstick quality humor will enjoy The Time Machine Did It, fans of The Simpsons are just about guaranteed to love it. So many of the crazy things that happen, and phrases that are said are unmistakably Swartzwelderian. (It SHOULD be a word.) Much like so many Simpsons' characters, Frank Burly is one of those loveably stupid, unrealistically stupid even, yet street smart folks that readers will have to love. A bumbling hero? Check Cowboy boots? Check. Western ranch? Check. Bizarre plot lines that go everywhere and nowhere at the same time? Check. It must be another John Swartzwelder book. 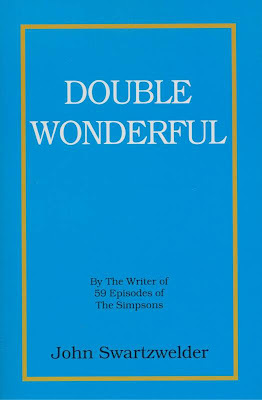 "Double Wonderful" is all those things, and so much more. This is not to suggest that the book gets any deeper than the check-list above, but there's more. Straying from private eye stories, John Swartwelder has us readers follow a new hero as he attempts to help a western ranch and a western town to find economic success. Those who have grown to love Swartzwelder's unusual writing style will appreciate the scores of sentences that end in a place so far from where they began, people will forget. If this is your first time dealing with a Swartwelder story, you may find yourself having difficulty following the story, or remembering key happenings. Thankfully, none of these things are important. You can pick up the book in the middle, and know everything you need to know to enjoy the rest. Much like his work with "The Simpsons," each Swartzwelder joke is a stand-alone. If this is not your first time dealing with a Swartzwelder story, you will likely find that the overall story is not as interesting as some of his others. And yet, a few of those stand-alone jokes are among his very best in this medium. While this story is not quite as outlandish as his others, the plot is still pretty far out there. In short, if you liked, The Time Machine Did It, you will like, Double Wonderful. The length of the book, a little over one hundred pages, should not be a surprise. It is a brief read, perfect for a day at the beach, or an afternoon under your favorite tree. You will not have to take breaks to absorb what you have read. The plot of "How I Conquered Your Planet," as expected, is about an alien invasion of earth. How does a private detective get involved with intergalactic warfare? Well, it's a Swartzwlder, so you don't really have to ask. You CAN read about it, though. Frank Burly gives a first hand account of his adventures, explaining how he wound up fighting for both sides, and ultimately falling backwards into interstellar success. Believe me when I say that Burly does nothing right, at least not through any fault of his own. Fans of Swartzwelder's non-literary work will appreciate the meticulous jokes scattered throughout the story. In fact, being as short as it is, a second read may be worth the effort, to pick up on any subtle jokes missed the first time. Those who have read Swatzwelder's other books may become tired of the writing style. Being another first person narrative, same patterns, etc. Once accepted, the redundancy of style is not really much of a deterrent. While I greatly enjoyed the read, one must look at the downsides, to achieve greater appreciation for the upsides. The repetitive writing style has already been mentioned, and to some degree, the shortness of the story as well. (The length can be a positive or a negative, depending on the reader.) Closely related to the length, is the lack of substance. 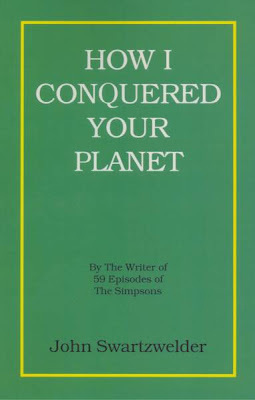 If Burly's clever quips are removed, "How I Conquered Your Planet" becomes a thirty page short story. Lastly, for being a small paper-back, this book, as well as others by Swartzwelder are surprisingly expensive. I attribute this to the law of supply and demand. Swartwelder is a lesser known author, so the supply is low. Although most commonly known for his work on The Simpsons, Swartzwelder began his career in advertising. His writing career began at Saturday Night Live, where he was introduced to George Meyer, who has also worked on The Simpsons. When George Meyer left Saturday Night Live to create the Magazine Army Man he recruited Swartzwelder as a writer for the magazine. 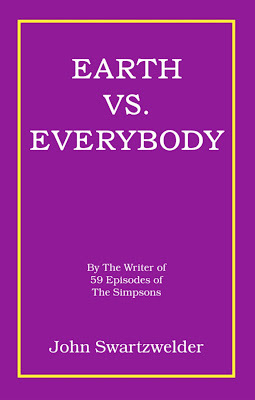 John is credited as a writer on 59 episodes of The Simpsons, which is far more than any other writer on the staff. He was recruited along with George Meyer by Sam Simon, one of The Simpsons executive producers, because Simon was a fan of the Army Man Magazine. John is an avid smoker and in 1994 he was given special permission to write his episodes from home and not attend rewrite sessions because California's Smoking Ban meant he could no longer smoke in the writer's room. 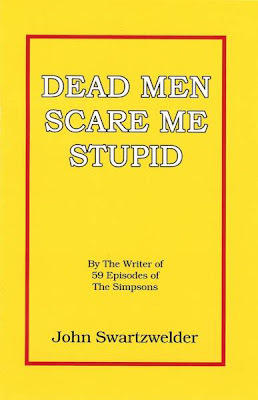 Fellow The Simpsons writers Al Jean and Mike Reiss have described Swartzwelder as a fan of Preston Sturges films and "anything old timey American". References to these themes can be seen in many of Swartzwelder's Episodes including carnies, 19th Century baseball players, Sicilian gangsters, hobos, and Prohibition-era speakeasies. According to Conan O'Brien, John Swartzwelder seems like he was taken right out of the 1840's. "We are amidst a televisual storm of entourages, mad men and cross-training athletes, yet I have neglected to cover any of them recently. But I can explain. For the last ten days, I've had limited access to television and internet, the two mediums I hold most dear. I managed to catch highlights--Roger Sterling doing his best Dan Emmett, a couple key football games, etc--but a large-scale relocation and new job have disrupted my TV routine, and loosened its normally sturdy grip on my head and heart. I have, however, been watching some more enlightening programs. And I would like to talk you today about Jesus. He's my own personal Jesus, and his name is John Swartzwelder. Superficially, Swartzwelder bears close resemblance to the majority of "Simpsons" writers. He's a Harvard graduate who figured out there are few things more intelligent than well-executed satire. He's reclusive, and probably not all that nice in real life. But Swartzwelder takes the grumpy, isolated writer stereotype to staggering extremes. In 1994, "Simpsons" producers began allowing Swartzwelder to submit scripts remotely, sparing him the grunt of the editors' meeting. (If you've ever worked as a writer for any institution, you know what an unbelievable blessing this is.) He refuses to participate in the writers' audio commentary on any DVDs--sitting around with headphones on, discussing the episode, is apparently too much social interaction for him. Swartzwelder is so hard to pin down, in fact, that for years the hordes of "Simpsons" internet geeks debated his existence, figuring "Swartzwelder" was a catch-all for more distinguished writers who didn't want a sitcom on their resume. Swartzwelder's oddness manifests itself in idiosyncracies as well as reclusiveness. He wrote nearly every episode at a particular booth in a California diner, chugging coffee and burning cigarettes like matches. (any writer who is a fan of either or both vices will tell you how necessary they both are to the, how do you say, creative process) When Cali passed an antismoking law, Swartzwelder bought the booth and installed in his home.